Mother's Day is a celebration to honour the mother of the family, as well as motherhood, maternal bonds and influence of mothers in society. Mother's Day is the day that we can show our Mom how much we love and care for her. On this Mother's Day, Mommy Jane woke up at 5.30 a.m. to be with the Little Angels as we joined our 1st Walkaton organised by the School. 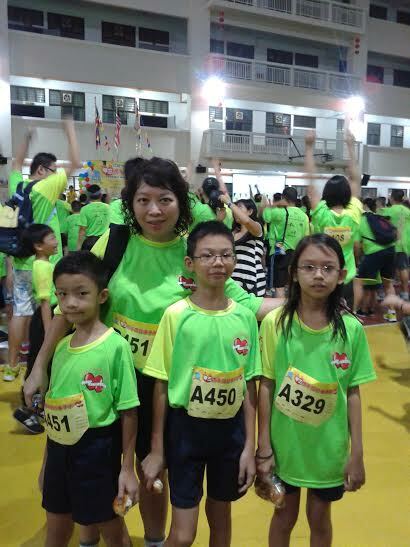 We walked for almost 1 hour before completed our walk and got ourselves a medal each. At the finish line, all Mothers got a carnation in conjunction with Mother's Day. All Moms had sacrificed their sleep to be with their children on this special day which include me. After the walk, we went to Sunway Putra Mall to have our lunch at Boat Noodle House. Surprising that the restaurant was full as compare to other restaurants at the Mall and we had waited for 15 minutes before we got our seats. After our lunch, we went to the Parenthood which located at the Level 2 of the Sunway Putra Mall to join their Mother's Day Colouring Contest. A Mother and a child were in a team-up to join the colouring contest together. Each child was entitled for a goodie bag worth more than RM40 and each Mom got a beautiful rose worth RM20 sponsored by the Parenthood in conjunction with the Mother's day. The participated children got to gave their Mom the beautiful rose themselves and a "Kiss" or "Hugs" while wishing their beloved Mom "Happy Mother's Day" and "We Love You". I got it too from my Little Angels. All the children were given 1 hour to complete the colouring with their Mom. Some even got the help from Daddy too. It is indeed a fun family times working out to complete the colouring together. A truly bonding moment between a Mom and a Child. Some parents and children were seen playing at the play area which is free for all. Some played the educational toys, the carom and even the scooter. Parents also did their shoppings at the beautiful decorated place on this Mother's Day with some of the outlets having a good discounts and promotions on their items for babies and kids. Kingston Mascot, the official mascot for the Parenthood. appeared for photo taking session and walk-around to greet all the children and shoppers. After 1 hour ended, the results were out. Congrats to the 1st, 2nd and 3rd Prize Winners. All prizes and goodie bags were sponsored by the Parenthood, My Kingdom and Faber-Castell. My Little Angels did not win anything but happy with the goodie bag given and all the children were then proceed to have their unlimited playtimes at My Kingdom worth RM45 each. If you want to know more of the events or contest or even promotions at The Parenthood, do like and follow them at their facebook page at https://www.facebook.com/The-Parenthood-983915141672761/?fref=ts. For My Kingdom playground, their website at http://mykingdom.com.my/ and facebook page at https://www.facebook.com/jepkingdom/?fref=ts. You can also check out more photos of the event HERE. While my Little Angels went for a play at My Kingdom with their Daddy, Mommy Jane went for a shopping and grab a sweater and a working dress. A present for Mother's Day. We went for dinner at 6 p.m. and Mommy Jane had choose to dine-in at Sushi King and the meal was sponsored by Daddy. We had a great day out on this Mother's Day and everyone were happy with the outing. A great bonding moment with my Little Angels on this special day. Emily, indeed it is. We enjoyed doing things together. It is good that kids learn to honor mother early in their lives. Loved this event. Seems fun! Rainbow, we need to instill it at them from young so that when they get older, it will become a norm. This is a lovely event teaching kids some good morale value and putting family first. Mums, indeed it is. Hope the Parenthood will organise more events soon so that parents and kids could do it together. May, tq. We had great times doing and eating together on that special day. Great Mother's day Celebration.. I had mine very simple simple one only..
Kylie, the most important is your loved ones besides you on that special day. what a nice mommy's day spent with cheerful activities with the kids! wow such a great family outing for you and your children. I believe it was a great day to celebrate Mother's Day with The Parenthood. Are they going to organise something similar during Father's day?